Ms. J. K. Rowling, a waitress and single mother, became phenomenally successful when she began publishing her Harry Potter novels, which became as much a craze on the screen as they were in print. As I understand it the novels were originally directed toward the older child/younger teen readership group, and Rowling intended for her readers and later the viewers of her stories to grapple with issues of good and evil. Who could have guessed that Rowling herself would be widely accused by religious fundamentalists of encouraging evil through tales of wizardry and character confusion in the Harry Potter collection? Yet, that is exactly what has happened, and even though Potter is at the end of his run, in the same way that several aging artists have had numerous “farewell tours,” the criticisms of his creator continue. My friend and mentor, John Killinger, was so amused and frustrated by the criticism of these remarkable literary works that he wrote two books on the subject: God, the Devil, and Harry Potter and then The Life, Death, and Resurrection of Harry Potter. I guess that tells you which side of the argument he came down on. Still, I would assume that most people in this church family would agree with me when I say that it is evil that so many lives have been lost in the preservation of American freedom. We honor our war dead on this Memorial Day weekend, those women and men who gave their lives trying to protect the freedom of this nation. They should not have had to die for that reason, and freedom should not be a way of life that costs human lives to preserve. The edgy, sometimes glorious music of Randall Thompson in A Testament of Freedom undergirds the singing of these profoundly truthful words by Thomas Jefferson: “The God who gave us life gave us liberty at the same time.” That blood had to be shed and continues to be shed to preserve this inalienable human right is nothing short of evil. That’s what I say, anyway. Halliburton has a differing perspective from mine, and from what I can see when not blocked by media marionettes the Halliburton way is clearly winning out over what I’d like to call my way. Evil is alive and well, and it’s been around a while with no plans to evaporate. The first eleven chapters of the book of Genesis detail the idyllic conditions of the world at the time of creation though some awarenesses of the ancient Hebrew people revealed that things were hardly perfect as they looked back–thus the questions, “What went wrong?” I want to assure you that none of those stories and not of the whole of Hebrew scripture has a devil to blame for whatever went wrong. The responsibility for the various evils considered rests squarely on the shoulders of human beings who made the choices. The decisions made by Eve and Adam, and the serpent for that matter, had nothing to do with the lure of a devil. Hebrew scriptures know of no devil. If there is evil in the world, and of course there is and always has been, then it is here because of human decision and activity. The satan in the book of Job is not a devil. Rather he is a chum of God’s. There is no doctrine of demonology until we get to the New Testament era. The failing of Adam and Eve and again the serpent had nothing to do with eating the fruit per se but with the effort to be divine instead of human or noble creature. The mythologists interpreted that as a great evil. Later after the dust from this mess settled so to speak Eve and Adam had their first two children, sons, Cain and Abel. Severe sibling rivalry was thus introduced into human experience. Cain came to believe that Abel was doing more to win God’s favor and was being successful at it. Cain was envious and angry as a result so he killed his brother. There was no devil to tempt him to do this evil act. He did it squarely, purely, only because he chose to do it. Though probably not a precisely historic account, the ancient Hebrew story about how they took the land that was already inhabited by the Canaanites, the ancestors of today’s Palestinians, was evil. I don’t care how many times you tell yourself and others that it’s okay, or how many times you insist that God is leading you to do it, it wasn’t, and it isn’t. In fact, you were doing evil, not good. Exactly the same truth applies to the Europeans coming over taking out the Indigenous Americans who had already been living here long before they, the Europeans, even thought about coming across the ocean. Not that it should have or would have mattered how long the Indigenous Americans had been here on this land, it wasn’t Europeans’ to take any more than it would have been justifiable for the Indigenous Americans to show up in London or Paris prepared to take those lands as theirs, claiming that the Great Spirit told them to do it. In a blog I stumble across from time to time, I found something from a blogger who identifies himself only as “Bret” meaningful and quite on target. I think we’d be much better off realizing that people take action because of what they think and believe in. Terrorists believe what they’re doing is good for their country (and many times for their god). Serial killers have very good reasons (if you understand their thought process) for murdering their victims. The acts that result in such tragedy are obviously not to be condoned, but ultimately it’s a process of warped thinking that drives people to do horrible things, not an invisible force. It seems to me that while evil can certainly happen on a truly individual level most evil thrives in groups. Even individuals taken initially to be acting alone in committing some heinous crime, as it turns out, are often only the puppets of a larger group giving orders and directions. Many people at first refused to believe Lee Harvey Oswald was acting alone in the assassination of President Kennedy. They still today are looking back with great suspicion of the single sniper theory. Similar thing with the assassin of Dr. Martin Luther King Jr., James Earl Ray. I don’t buy in to everything Paul wrote, nor do I believe he was successful at all he undertook. I am convinced, however, that much of the time his heart was in the right place, and he hoped to advise churches to live according to the principles of love he delineated when he was at the summit of his writing ability and his theological reflection–both at the same time. I’m talking about when he penned what we now designate as the thirteenth chapter of the book of 1 Corinthians. Surely, no one lives under the delusion that everybody in a church will always agree on every principle unless a given congregation is ruled by a dictator, and even then there are very secret disagreements spoken only in the most secret of places. The fundamental principle from Paul about dealing with conflicting opinions can be summarized with this kind imperative: “Speak the truth in love.” In other words, don’t speak any words to or about anyone that are destructive, harmful, hurtful, selfish, belittling. Otherwise, we can wound struggling seekers, and that Paul regarded as evil. It’s certainly something we must consider. Now, jump back before Paul. Jesus’ disciples became more than a little bit concerned about how unrecognizably many doers of evil could comfortably and naturally fit into and blend in with the general population. They, the disciples, took themselves to be the good guys and gals as is typically the case with those to sit down to assess what is evil what is good. Usually what I as the assessor am doing is considered naturally to be for the sake of good–at least by me. And what others are doing that disrupts what I want to have happen is evil from my perspective. So, the issue prompted Jesus to tell his now famous parable, the wheat and the tares. This in essence is what Jesus had to say about the intermingling of good and evil in the everyday lives of all the folks he knew anything about. Wheat was the most important food staple in the diets of all but the poorest of people in Jesus’ day, in their part of the world; the poor folks had to settle for barley, which ironically has been discovered in recent years to be healthier for us than wheat. Farmers grew wheat wherever they could. An enemy could easily sneak into a wheat field under the cover of darkness and sow seeds for tares right in the middle of the developing wheat. By the way, doing such a thing was considered so vile and destructive that it was against the laws of the Roman Empire. 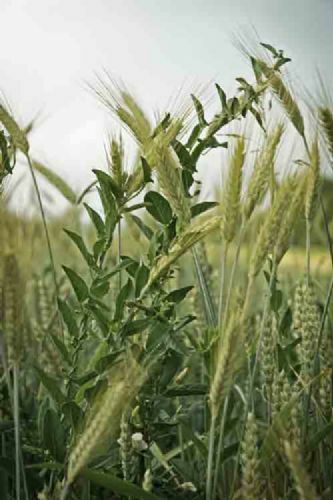 In the early stages of growth, wheat and tares, which are darnel plants, are indistinguishable. By the time the wheat and the tares could be differentiated from each other, the farmer was in a mess. One couldn’t uproot a tare without also uprooting the wheat plants to which the tare roots had attached themselves. Leaving the tares to grow to maturity almost certainly would damage some of the wheat, but trying to weed the wheat fields would damage much more of the wheat. The disciples, growing in their theological sophistication, see, metaphorically, the wheat as the good people in the world (including themselves, of course) and the tares as all the evil people in the world. OK, so it’s one thing to say this or think it, but facing it in a real world way is more than problematic. Alas, all people outside Hollywood and Bollywood look alike. They’re all growing together as it were, and trying to separate them until the actual time of harvest was a lose-lose situation for farmers and their wheat. Only the tares could win out, as it were, because they had accomplished their destructive purposes. The disciples asked Jesus how in the world they were supposed to deal with such an unnecessary and dangerous complication. I mean, in a worst case, real life scenario, what if they who wanted to protect Jesus in every way were somehow duped into bringing someone into the inner circle who pretended to care deeply about Jesus and the Jesus Movement, but in reality this person was only there finding a way to do harm to their beloved leader? Little did they know that those who would ultimately hurt Jesus most would not be malevolent spies, but rather those who honestly loved Jesus with misguided love, or else they meant well but simply didn’t have the strength of their convictions, therefore, in the end, letting evil take the lead. Jesus said, “Well, ladies and gentlemen, as unfair and as frustrating as it seems, you really have no choice but to wait until the harvest. Harvest will be more complicated and time consuming, but it won’t matter any more. Yes, some damage will have been done, but not nearly as much as if you tried to separate the wheat from the tares while the gardens were still growing. At harvest, it’s time for the wheat to stop growing anyway so the tares can harm it no more. Then and only then can you sensibly separate the wheat from the tares. As far as humans go, you can’t just go around extracting those you take to be evil. Wheat and tares, after all, look a good bit alike as I’ve said. There will be a great harvest one day, and maybe several lesser harvests along the way, when the tares are removed. Until then, some wheat will be harmed by the tares, but much more damage would be done if separation is attempted before a harvest. This very thing was literally an issue during the most recent war in Iraq, Operation Misnomer, making doing one’s job on the battlefield a really complicated situation. The Americans trying to figure out which Iraqis to shoot were hampered because the enemy soldiers were un-uniformed meaning that the Americans were supposed to shoot into areas where they were pretty sure Iraqi soldiers were intermingling with and dressed like other Iraqis–civilians including children. Some loathsome Iraqi military leaders decided that children, especially orphans by the way, would make excellent tools of war. Not understanding what was going on, the kids were strapped with explosives and told to go over and get treats from the nice Americans who would help them find their parents. If you were wondering if evil were real, wonder no more. At any rate, in that situation there was no way to pick a soldier out of an Iraqi crowd. Furthermore, much shooting had to be done by the Americans as well as the Iraqis in that war for simple self-protection. The fact is, on a one to one basis there were very few Iraqis who had anything personal against even one American, and very few Americans had anything against individual Iraqis. Not all Iraqis who shot Americans were evil, morally reprehensible people; they were only doing what their superior officers commanded them to do; so there were some good Iraqi people in the mix. Certainly many an American, not all of them being morally upright and free from evil, brought goodness to the battlefield; most of them were remarkable women and men who shot at Iraqis, with the intent to kill, because that’s what they were commanded to do. Let’s say that most soldiers on both sides were good people fighting unknowns that their leaders referred to as enemies. No one could pick out the good ones or the bad ones from either side or on their on side for that mattter; the only option was to kill all you could so the war would be over, and you could get home to your loved ones–as close as Baghdad and as far away as Birmingham. If you want to see what evil looks like, don’t look at the soldiers on the battlefields. You can’t separate the wheat from the tares to this day there, but you could have seen fields full of tares with hardly any wheat growing among them by finding and looking at the hidden, protected leaders calling the shots on each side. There was no devil influencing either side because there is no devil. Human beings on both sides were responsible for choices that made evil come alive. This is how evil works: the effects of Operation Misnomer are still with us–in the hungry people who could have been fed many times over with the money spent on the pointless deadly violence, in the sweaty and horrifying moments of post traumatic stress syndrome for the military personnel who can’t make their brains let go of the fear and mutilation that once were ever before them, in a repugnant example to our children and children’s children of why big time bullying must be kept alive, and in the wards of military hospitals caring for those military personnel whose wounds will never let them leave the technologies that keep them alive, sort of alive anyway. The book of Revelation is both a sobering as well as an overwhelmingly hopeful book. It’s a truth in your face kind of document. The writer is saying that, for the most part, evil will always be around the plague humans who stoke its fires. Often, in the efforts we take to try to eradicate evil, we win some, but good people get hit and hurt and destroyed along with the evil ones. Let me say that again since it’s something hard to take in: combating evil may well take out some of the evil in the world, but tragically it is often the case that good people are hurt and destroyed along with those propagating evil. So, back to Harry Potter. I have not been a careful devotee, but have read a bit and watched a few and have kept up with the general flow of things. There is not an utterly consistent perspective on evil throughout the series. 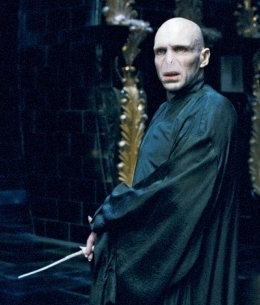 The other view, and I believe the one that gets most of the attention, is that evil is always real and is always connected to an evil force, but that force becomes increasingly visible and personified with each installment of Potter. I didn’t see that last Potter film, but Stefan Guenther, our Office Administrator and with his wife a Potter devotee, assured me that while on the surface everyone appeared in the last moments of the last film free from evil, there were plenty of possibilities for another eruption of evil at some future point should Ms. Rowling decide that she doesn’t like writing for adults. In our culture when someone says to someone on the hearing end of a conversation with her or him, “You’re one of those people…,” or, “You’re one of those kinds of people who…,” what follows is usually not complimentary. There are exceptions, of course, but usually, I say again, what follows that kind of beginning to a sentence isn’t complimentary. In principle, I knew she was on target, but in reality could one ignore missing money needed to pay bills and missing articles that had taken weeks or months to write gone for good requiring rewrites. How could one dismiss the clandestine handing over of his beloved and probably irreplaceable orange leisure suit to Good Will Industries? I could not ponder those at that moment, however, because I’d been called less than a gentleman and by my own wife! Ouch! I was wounded to the core. My gentlemanliness had been called into question. Certainly, there was a code of gentility in the south, and the not so old south also by the way, that was less rigorous than the codes of chivalry in the Middle Ages but nonetheless pervasive. For example, did you know that ladies in south did not sweat; they beaded. A lady did not faint; she vapored. A gentleman always opened the door for a lady even after the advent of the women’s liberation movement when opening the door for a presumed lady could get you a dirty look if not a hateful remark. A gentleman tossed his cloak or overcoat over the mud to keep a lady from having to mess up her own shoes. The lists go on. I don’t think I’m a blamer at all. To be precise, there’s quite a difference between blaming someone and expecting that person to take responsibility for her or his actions. I do think that I am someone who wants to know who is responsible for what went wrong–whether that’s at home, at work, on the battlefield, on Wall Street, or in the Oval Office. Responsibility and accountability were twin messages underlying much of what Attorney General Biden said to the Wednesday evening group this passed week when societally trying to correct many of the problems from which we just can’t seem to shake loose. My parents planted in me, from a young age, the self-requirement to accept responsibility for my actions–the good ones and the bad ones. An example of a lesson taught, probably more than fifty years ago, was the bubble gum issue. At the Piggly Wiggly grocery store, five pieces of bubble gum sold for 5 cents. Once I took six pieces rather than five, but only paid the nickel for my gum. At home, Dad saw six pieces of bubble gum, but he knew that I only had a nickel in my pocket. He immediately drove me back to the grocery store and marched me up to the cashier who’d rung up my gum, and he made me tell her I’d taken one piece more than I paid for. That made a point with me, don’t you think? Here I am still talking about it more than a half century later. On the way home, I got the verbal lesson that went along with the contextual lesson. The lesson was exactly two sentences: “No son of mine is going to be a thief.” Since I was the only son he had at the time, it was pretty easy for me to figure out who wasn’t going to be a thief. Sentence number two: “No son of mine is going to be too weak to stand up and take responsibility for his actions.” Well, I hold myself to that practice, and I guess it’s true that I hold others around me to the same standard, if they are able to hold up under the weight of reality; not everyone is. How can you be bent out of shape when information has been presented to you in that manner–even if you must live the rest of your life without a gorgeous orange leisure suit? Nathan wasn’t the typical prophet tapped to preach for King David. When he was asked to preach the sermon for one of the Sabbath services attended by the King, he had a message especially prepared for the popular monarch. He intended to confront him with reality even though David was accustomed to having his ears tickled by the prophets invited to preach in his presence. Girolamo Savonarola, the fiery Italian preacher of the European Renaissance era, was a kindred spirit to Prophet Nathan, and he was highly critical of his fellow preachers employed to preach for powerful politicos. He said they’d rather get a compliment from a higher up, and maybe a little extra cash also, than to preach truth at any cost. He called those sycophant sermonizers lapdogs. You can imagine that he wasn’t elected president of his local pastors’ association. These preachers in the Middle Ages and the ancient prophets as well were not preaching to large diverse groups in a congregational setting. They were preaching to the king or some other political powerhouse, and they were preaching only to that power person and his immediate family and perhaps a few of his servants. President Obama, as is true of his churchgoing predecessors in recent memory, attends a typical worship service in a local congregation with many other congregants, people from all walks of life. It is not proper for the preacher when the president is in attendance to preach to him or to advise or encourage him in or through the sermon. An exception is the service at which the president specifically is preached to in a sermon the day after a presidential inauguration. Remember that day after the most recent inauguration when President Obama and Vice President Biden came into the National Cathedral to hear Dr. Sharon Watkins preach. She is the executive minister of the Disciples of Christ, and she did a bang up job. She was both pastoral and prophetic in her remarks to our leaders, with only a few hundred gathered there with them and a few million watching her on real time television. She was no lapdog, but she was kind in reminding our leaders what the American people and the world needed from them. She has remained one of the President’s spiritual advisors. OK, so Nathan’s sermon to King David began as the sermon of a lapdog might begin. He was telling a sweet little story about an unnamed man’s pet ewe lamb whom he loved like a daughter. We pet people know what it’s like to love pets as if they were human. Nathan’s sermon, though, took a wicked turn. A neighbor who had fields full of sheep took the man’s beloved ewe lamb, slaughtered her, and served her at a feast for his friends. How cruel and grotesque. Somehow, David thought that his affair with Bathsheba had been a well-kept secret. Yeah, about as well kept as directly reporting it to the Associated Hebrew Press. Everyone knew that David had begun an affair with Bathsheba who liked to bathe on her roof long before her husband died, leaving her a widow. Many people had also well before Nathan’s famous sermon was preached put together the pieces of the puzzle of Uriah’s, Bathsheba’s husband’s, death. Uriah was one of King David’s military standouts. In a particularly bloody battle, he had Uriah’s superior officers place Uriah in a sure as fire death zone, and Uriah was, as expected, killed leaving Bathsheba free to marry King David. David already had wives and concubines–not nearly as many as his son, Solomon, would gather, but plenty. Suddenly the sad sermon application hit. David himself was the neighbor with herds and herds of sheep who took the ewe lamb from the man who had one sheep, Uriah. Bathsheba was the ewe lamb who, in Nathan’s story, was helpless though in real life she wasn’t helpless at all; she willfully began an affair with the King while her husband was alive and away from home in service to King and country. Are there any fingers pointing at you these days, directing you to own up to what you’d just as soon forget about for good? In some cases, yes, I’d say. In some cases, no, because there are those genuine souls among us who live entirely by accepting responsibility for any of their mess-ups or wrongs. World renowned therapist, the late Virginia Satir, said until we own all of who we are and what we’ve done–the good, the bad, the ugly–we can never be whole. Interestingly, baptism is related to taking responsibility for oneself. Baptism isn’t just a Baptist thing nor is it exclusively a Christian thing. Many of the ancient polytheistic cultures had baptismal practices. In monotheistic tradition, the Jews had baptismal-like rituals for lifelong Jews as well as for converts. Most people associated with Silverside Church today, our members and our friends, were baptized at some point in their lives–either as infants or as teens at the culmination of confirmation processes or as adults. Baptism is not a foreign practice to people who are on a spiritual journey. Our church doesn’t require or even subtly push those who want to be members to be baptized; it’s strictly a matter of one’s choice or preference, and we certainly don’t ask those who have been baptized in other traditions to get re-baptized in the manner that is in tradition of this congregation. We do, however, offer baptism as an option for those who believe they will find it meaningful, and about once every ten years or so, someone does. We and our water pump as well as our water heater and the pastor’s baptismal garb must stand ready to serve when called upon. We don’t know when in a given decade someone will ask. Many progressive Christians have discovered in recent years that their current spiritual thinking causes them to look back to their baptism as a less than satisfactory experience. This is true for several reasons. One is that they were infants when baptized and had no choice in the matter. Another reason would be that the baptism they experienced carried a meaning they can no longer embrace. This is akin to the Lord’s Supper dilemma for many. There are those who began partaking of the Lord’s Supper in a tradition that would have had them believe communion was an ingesting of the literal body and blood of Jesus. It also emphasized repeatedly that their ability to be okay with God was dependent on Jesus’ bloody death to which the Last Supper/the Lord’s Supper was prelude; thus, they were taught that Jesus had to die to save us from our sins and to save us from an eternal burning hell. Today they walk into a worship room where they see a communion set up, and they turn around and run in the other direction. Nothing is further from their core beliefs than that God is angry and required the death of Jesus to appease the divine wrath. Even though there’s an abundance of groups who celebrate communion with precisely those thoughts in mind, that does not mean that perspective was what Jesus intended. In fact it was not Jesus’ take on the Last Supper in any way. His teaching was: remember me every time you have such a simple meal. So also with baptism, which has been woefully misunderstood. Baptism is not what one does to get in good with God. Baptism is not what one does to get on God’s good side. Scripture knows nothing of infant baptism; the only baptism known of is baptism by choice. The form in Jesus’ day happens to have been baptism by immersion. That’s the way Jesus himself was baptized. He certainly didn’t ask his cousin and mentor John the Baptist to baptize him because he was afraid that, otherwise, he’d die in his sins of display disobedience to God. Baptism for him was a means of identifying himself with a given ministry and mission. He was, through his baptism, taking responsibility for who he’d discovered himself to be and what he would, therefore, do–regardless of who approved and who disapproved. A, “Yes,” meant imprisonment and ultimately, for many, death. A, “No,” meant personal safety and a repudiation of responsibility. John the Baptist–remember the fiery Jewish preacher?–baptized Jesus by immersion long before there was a group who’d call itself Baptist, and Baptists by no means would be the only group within Protestantism to practice baptism by choice–by immersion and by other means such as pouring. Baptism isn’t a requirement in this congregation, but for those who want to participate in it to help them say who they are along their spiritual pathway of seeking we bless that request and happily participate in it. 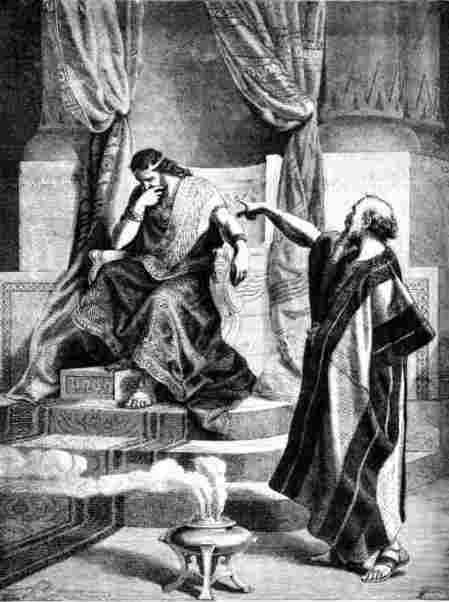 King David had the prophet’s finger pointing at him because he was trying to pretend that he’d had nothing to do with a series of acts that were morally reprehensible. He could have had Nathan’s pointing finger chopped off and his head too, but he didn’t. He owned his wrong. Many enemies of the Jesus Movement across the years have pointed at those who identified with it by seeking baptism; later when asked to confirm their baptism as their way of taking responsibility for trying to live and serve as Jesus did, they could either deny it by lying and be sent on their way with the Emperor’s blessing, or they could affirm it and face punishment that sometimes took the form of execution. Many in our day, for various reasons, will choose not to be baptized; in our church, that’s an accepted and respected option. There are those, though, who commemorate a milestone along their spiritual pathway and/or who say who they are to the world by walking through the waters of baptism by choice. “The Wizard of Oz” was the favorite film and for that matter the favorite story of my childhood. Unfortunately, it only came on television once a year. There were no film rental agencies in those days so anybody who wanted to see the movie version of L. Frank Baum’s brilliant tale, which was actually a cover for some rather heavy handed social and political commentary, had to wait for its annual showing on 1 of the 3 television networks. My family went to church every Sunday morning and Sunday evening. My father and mother tolerated no excuses for blowing off church–morning or evening. When I played sick, thinking and hoping the rest of the family would go on to church and get out of my hair so I could watch my show, they would play right along with my alleged sickness. Mom would say that since I was so very sick she just couldn’t live with herself if she were to leave my side. She would stay at home with me, and of course she prevented me from watching television since I was so sick and, she insisted, needed my rest. As a result of a no absence policy when it came to church, I only got to see Judy Garland and friends three or four times until I was a college student who could watch Sunday evening television if he wanted–even though my fellow holier than thous at our small Baptist college frowned on anyone who stayed in the dorm for either homework or television instead of going to church. I didn’t miss many Sunday evening services even before I was appointed to a church staff as a minister of youth, but if “The Wizard of Oz” were coming on, frowns or no frowns from the hyper-religious Carson-Newmanites, I was in the t.v. lounge watching that amazing film. The author’s, L. Frank Baum’s, political commentary is not our concern today. We are only looking at the surface story, which in and of itself is a wonderful thing, with lessons aplenty for both children and adults. If you don’t know the story I will summarize very briefly. A young lady who thinks that she has a really rough time at home, not to mention how boring home is, longs and longs and dreams and dreams of a better place. She becomes convinced, based on something she remembers from a lullaby sung to her as a little one, that there is this better place over there somewhere. Perhaps the birds convinced her that it was up there because they always seemed so happy to her and often flew far out of sight. Maybe when they were out of the sight of human beings they were in that special place where everything went well for everyone and everything. 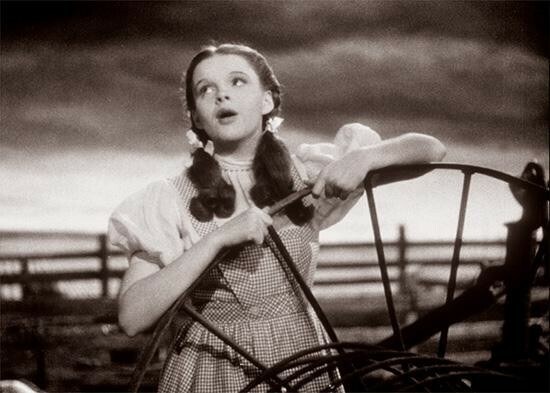 This gives Judy Garland, playing the girl, Dorothy, the opportunity to sing one of her most famous recorded songs, “Somewhere Over the Rainbow.” It was such a beautifully sung song with such an inspiring, hopeful message that it was nearly impossible not to join Dorothy in believing that there was a better place, somewhere far away from all that frustrated and confused and bored us. There’s a lion who lacks courage. There is a tin man who obviously lacks a heart, and there’s a scarecrow who is missing a brain. They are led to believe that if they make their way to the great land of Oz and somehow find a way to make their requests known to the mighty Oz himself, something frankly few are able to do, they have a shot at having their wishes granted. Sadly, the great Oz is a fake though he pretends to be all powerful so that after scaring them he may be able to help people feel better about themselves and their plights. So Dorothy comes to find out that even her supposedly perfect place has its flaws, and in the end there’s no place like home so she yearns to be back at home surrounded by the people who love her. When she comes to, after the effects from the blow to her head subside, that’s exactly where she is. A tough lesson for Dorothy and many of us to have to learn, especially those of us who think that there is a place better than where we are living. Maybe in some cases there is a much better way we can enjoy life if we are willing to change geographical locations; however, the bottom line is most of us find out if we try to make a move for a better life because we’re dissatisfied with how things are where we are that pretty much life becomes where we move the way it was where we left, and the moral of the story is that most of us live most of our lives under the rainbow. The function of the rainbow in the Noah story is to remind God that God will never destroy the Earth or the human race again by flood. It is not to say that some other means of destruction will go unused by God, but God makes this covenant with humanity, with Noah as a representative of the humans who will hopefully be born in the re-population process, that there will be no more mass destruction of human beings, animals, parts of the earth itself by means of a flood. And so after a hard rain when the rainbow comes out God is reminded that causing another flood is a no-no. Well, I have to tell you, that makes me a little nervous. Why should God need a reminder not to do such a horrible thing? It’s a gruesome story, really, but we can say that the rainbow softens the God otherwise portrayed as easy to enrage. Even those who take the Bible, and this part in particular, literally, can breath a little more easily now. At least, life under the rainbow will be free from one serious threat: a destructive flood. It would be nice, wouldn’t it, to have all the low points and potential low points removed entirely from the picture, wouldn’t it? I think it would, and I don’t connect at all with those who say, “If you had no pain, you couldn’t understand pleasure.” Uhm, ok. So, for me I’ll happily accept a minimized understanding of and experience of pleasure in exchange for a no pain zone. The ancient Hebrew stories about the creation of the world pictured it, as per God’s intent, as a place without pain of any kind. God was a lot nicer then; evidently, as the Hebrews saw it, God became jaded over the years because of the lack of appreciation on the part of humans for what God had done for them. Sadly, God turns really mean most of the time. That, of course, isn’t an accurate portrayal of God at any point in time. From beginning to end, God, the alpha and the omega, is love. Life has its hard times, but God is not the cause of those…ever. The ancient Hebrews said that prophets who try to tell you life is nothing but sugar and spice and everything nice are false prophets. If they cry out, “Peace! Peace!”, when there is no peace, then none of their messages are to be heeded because they are either liars or people outside the realm of reality somehow. Constant happiness isn’t the result of having the right kind of faith, whatever that would be. On the other hand, we, hopefully, would not let the tough and sad turns that life has thrown our way cause us to put a moratorium on happiness as if to brace for the unknown unhappiness bound to hit us sooner or later. That’s a horrible way to live, though I’ve certainly known enough people who can’t seem to catch a break, as we say. Something is always going wrong at some level. Someone struggling with just this kind of thing said to me once, “Life has become for me a waiting game. I live expecting the next shoe to drop at any moment.” Such a sad way to live, but we can understand why someone bombarded with hurtful complications could end up at just this place. Through the rain (Thomas Carl Keifer). There is no place where troubles melt like lemon drops–down here, anyway. Here under the rainbow most of us must deal with a combination of challenges and sadness mixed in with the blessings and gifts and joys and opportunities. Most of us live in the mix of good and bad, the simple challenges and heavy duty challenges. We try to make the most of every opportunity that comes our way in life, and we hope that when the great tally is taken there will be more good than bad, not to please God or anyone else but so that the true enjoyment of life will have beaten out the distractions and the negativity. In Alice Walker’s brilliant The Color Purple, several of the female characters are victims of domestic abuse. Their husbands beat them when they do something that is displeasing to the husbands. Along comes Sophia played in the film version by Oprah Winfrey who upsets the apple cart by making it known that she will not under any circumstances put up with being hit by her husband, Harpo. She says she will kill him dead before she puts up with that kind of nonsense. Fortunately, their love for each other prevailed. He stopped hitting her, and she didn’t have to kill him dead. However, before the resolution to their difficulty her husband, Harpo, goes to his step-mother, Celie, and asks what he should do with Sophia who will not do what he tells her to do. Celie, herself a victim of serious physical abuse at the hands of her husband, shocks the reader or viewer of the film or stage play when she says to Harpo, the way you have to deal with Sophia in order to make her do what you want her to do since you’re the husband is to beat her. Celie and Sophia are friends, and Sophia goes directly to Celie to protest the advice Celie gave to Harpo. Sophia can’t believe Cellie would have said such a thing. Celie attempts a mild defense, essentially saying that a wife has to do what her husband demands. Besides, Celie goes on, this life will soon be over, and then you will have an eternity not to worry about being beaten by Harpo or anybody else. Sophia responds by saying I think you need to rethink. I think you need to bash your husband’s head in and think on heaven later! There have been whole groups of people who have lived out their entire earthly lives coping with the hardships of this world by focusing as much as they possibly could on that magic place over the rainbow. We can understand it for some of these people; having that perfect place to think about was survival. Others knew better or at least their leaders knew better and still used this image of the perfect place somewhere else as a means of controlling their followers. An explanation of the core of their various messages to their followers would be simply this: if you don’t do what I tell you to do you will not end up in the good place–not now and not in eternity; instead of finally ending up over the rainbow you will end up in some place of eternal punishment. I had the privilege last night of having dinner with one of my fairly recent former seminary students. Those of you who know me know it had to be something really special to get me away from my sermon polishing on a Saturday evening. I rarely leave my home on Saturday evenings, but this former student is special; and seeing him is rare so there I was. He presently lives in Canada where he’s seeking his first post-seminary ministry opportunity. He’s immensely talented as a preacher, and in other areas of ministry as well. He’s a newlywed, right at the one year mark. I asked him how marriage was going for him, and he said that he was surprised at the tough moments they had to deal with during year one; so much in love, and being such a positive person himself, he expected little or no tough times. As I would have predicted, they pulled through with a serious, verifiable growing love. As the film ends, Dorothy is home. For the author, Frank Baum, “home” is a metaphor for life under the rainbow. Everydayness for all of us, I suppose. For most of us: some good; some bad; some boring. A place of comfort when injured. A circle in which love is real and unconditional for the lucky ones under the rainbow. Many years ago when my kids were kids, we were living in the wild city of New Orleans at a time when it attracted all the big name performers around the country. It so happens that we lived near the University of New Orleans who hosted magician David Copperfield. It is true that many university students near ends of terms go out in search of a magician, but I wasn’t able to prove that connection. I nabbed three almost-front-row seats for the boys and me; their mom wasn’t interested in seeing Copperfield. I think she was jealous at how much makeup he could wear and “get by” with it. I’d been intrigued with magic from the time I was a kid. I asked for and received for several Christmases or birthdays beginning magicians’ magic kits. It was a sad sight seeing me blunder even the simplest tricks as I eventually discovered that this could not be the profession for me–a parallel discovery to the realization that I wasn’t cut out to wear tank tops. Oh well, that’s for another church social event where something stronger than coffee is served. My inability to perform magic tricks didn’t water down my interest in magic, though. No ma’am; no sir. Though Houdini was deceased before I ever heard of him, I became intrigued with him and with the amazing illusions he had performed–until the last one went terribly wrong and killed him. I read every book I could get my hands on about Houdini at the Halls Community Library–both of them. Even with my avid interest in magic, I don’t think I was ever able to see any of the greats in person until the opportunity to see David Copperfield came along, and I enjoyed every millisecond of the performance. The boys and I waited in a bit of a line to meet him after the show, shake those magic hands–which were gloved for public contact, and get our programs signed. The auditorium in which we watched the master magician do his work wasn’t terribly large so we felt very much a part of what was going on–even the finale when the lights flashed once and instantly came back on to reveal that a huge motorcycle that had been on stage was now on the walkway separating the good seats from the cheap seats. Jarrett, Carson, and I talked for months about how Copperfield could have done what he did before our very eyes, as it were. The Bible generally takes a dim view of magic, mainly because the illusionary part was generally overlooked–both by performer and audience–leaving there to be the strong possibility in the minds of the people written about in both the First and the Second Testaments that evil forces were at work in making wonders happen. More often than not, anyone who could perform wonders at any level was regarded as a witch and condemned by so-called faith communities as akin to the demonic forces, invisible but nonetheless powerfully and relentlessly at work for evil. Not all ancient cultures shared the Hebrews’ distaste for magic, which is how we ended up with tales such as Aladdin and the magic lamp. Should we be concerned about magic in our time? Magic is illusion and is to be distinguished from what we might call “the miraculous.” Miracles are performed by mediums of God or mediums of evil–at least the way most biblical stories dealing with the subject view it, and there are two basic types of miracles either “side” may perform: miracles of the mind and miracles of the material world. There are numerous samples of these in Judeo-Christian scripture. In our high tech age it is no easier to determine what is illusion and what is not than it was in ancient times. Maybe the stakes between understanding what is real and what is not are higher than ever, though. Let’s have a look at three stories from the life of Moses: the burning bush, his brother’s walking stick or staff that turns into a serpent, and the parting of the Red or Reed Sea. First, in order of appearance, the burning bush. The broad background of the story is that Moses is out tending sheep in the desert, and he sees along the barren, dusty landscape a bush that seems to be burning though not being consumed by the flames. Out of this burning bush, the voice of God calls out to Moses and gives him his ministry challenge of leading his sister- and brother-Hebrews out of Egyptian enslavement. God isn’t merely speaking through the bush, but also hearing through the bush so that God hears Moses’ protests at having been given such an assignment for which he feels utterly ill equipped. What happened as a result of all that isn’t part of today’s sermon. We’re only concerned with the burning bush. How could a bush of any type be on fire and not burn up? 1) Some would say that when God is involved anything can happen; since God wanted to get Moses’ attention this burning bush was the means through which God chose to communicate with Moses. 2) Others would say that it was a beautifully told fictional tale filled with spiritual truths. 3) Still others, those who seek synthesis, would say there was a bush in the desert areas where Moses would have traveled with gleaming orange and red leaves that with sunlight and wind looked at a distance like it was on fire though it really wasn’t covered with flames at all. If this were anything more than symbolic, and don’t minimize the importance of symbolism, it would have to be classified as a God-ordained nature miracle. It wasn’t magic; it was miraculous, and the forces of God and good brought about the miracle. Second story from the life of Moses. I want to read a little scriptural snippet for you at this juncture. Moses and Aaron are about to get an audience with the mighty Pharaoh and dare to tell him that the God of the Hebrews sent them to let him know that he, the Pharaoh, had to let the Hebrews go free, which was going to be big news, and funny news, to the Pharaoh who hadn’t heard a word about an emancipation program from any of his gods. God told Moses and Aaron that Pharaoh would almost certainly ask them to perform an act of wonder to prove that they had connections to some divinity. The Lord said to Moses and Aaron, “When Pharaoh says to you, ‘Perform a wonder,’ then you shall say to Aaron, ‘Take your staff and throw it down before Pharaoh, and it will become a snake.’ So Moses and Aaron went to Pharaoh and did as the Lord had commanded; Aaron threw down his staff before Pharaoh and his officials, and it became a snake. Then Pharaoh summoned the wise men and the sorcerers; and they also, the magicians of Egypt, did the same by their secret arts. Each one threw down his staff, and they became snakes; but Aaron’s staff swallowed up theirs. I guess that’s the no-more-arguments way of showing who’s the boss! So, it turns out that these were all “tricks,” acts of magic except the final part of the episode when one trick snake ate all the other trick snakes. Or were they trick snakes at all? Some snakes, including many cobras, will play dead and completely stiffen up, so I am told, when threatened, and the same effect can be gained by pinching the back of the snake’s neck. Please be aware that I am not suggesting you try this at home. 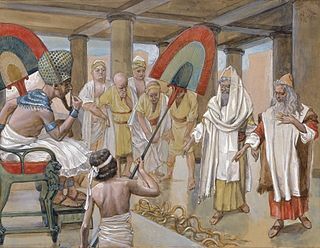 If this is what Aaron was doing, when it was time to show the Pharaoh a trick, he simply threw the frightened, stiffened snake on the ground at which point it awakened and attempted to slither away to an escape. As to Aaron’s snake eating the others, well some snakes as we know are carnivorous and if hungry enough will eat their own species. Eating several other snakes all at once seems a bit of a stretch, but even so there was nothing magic or miraculous here in this case at all–simply a knowledge of how things work in nature. The third bit of potential magic from the life of Moses was his parting of the Red Sea or the Reed Sea so that the Hebrews running for their lives from the Pharaoh’s recovery troops could get to the other side as dry as stale pita and with not even a speck of mud on their sandals. Of course, as the story was remembered and told, the second the last Hebrew was safe on the other side, the waters closed back in and drowned the Egyptians along with the horses they were riding and the horses that were pulling their finest war chariots. In this case, God was clearly working through Moses who used his staff to strike the waters causing them to open for the Hebrews. Good magic huh? Or, good miracle. The suspicion toward magic and miracles was carried into Jesus’ life and culture. Magic wasn’t so much an issue despite the portrayal of Herod Antipas in “Jesus Christ Superstar,” but miracles were big deals; and the source of the miracle that any miracle worker was able to work had to come either from God or from evil so there was frequently much talk about which source was behind the feat. Those who really wanted to insult and diminish Jesus would accuse him, in terms of the miracles he performed, of being in service to powers of evil and darkness rather than in service to God. Generally, those suspected of needing deliverance from the dark side were forced into exorcisms so that they might be freed from the control the evil was exerting over them, even if whatever it was they were doing along the lines of wonders weren’t hurting anyone. Case in point: the Apostle Paul and the clairvoyant slave girl whose peerings into the future were making big dennarii for her owners. Paul described her as having a “spirit of divination”; today, we’d likely call her a psychic. In her day, psychics were rare; in our day, they are numerous despite the fact that Patrick Jane on his show “The Mentalist” has a job as a psychic even though he insists that there’s no such thing as a psychic. The enslaved fortune teller got on Paul’s nerves, and if the truth is spoken that’s the only reason we know anything at all about her today. The writer of the book of Acts remembered how much Paul had claimed to be irritated by her. It’s really odd, and her ability to see into the future undergirds Patrick Jane’s view of the psychic life, that Paul was so put out with her. This was her offense. When she saw Paul and his entourage, she began following them around saying the most horrible thing: “These men are slaves of the Most High God, who proclaim to you a way of salvation.” Heavens! Wash that girl’s mouth out with soap. I have no idea why this irritated Paul; maybe he wanted to hog all the attention and make his own announcement of who he was and what he was about. It seems to me that he should have appreciated her insight and affirmed her for being on target rather than condemning her as a lunatic controlled by an evil spirit who allowed her to know facts about other people before they’d made known those traits themselves. I don’t think it would bother me if when I entered Concord Mall, a self-proclaimed psychic would follow me around yelling out, “This guy is a decent preacher over at Silverside Church, and if you hear him he will affirm you on your spiritual quest and confront you with the reality that God loves you no matter what.” I mean, what’s to be upset about? And I’d save so much money on teeshirts. Anyway, Paul got so tired of hearing her that he suddenly turned on her and performed an emergency exorcism. Not everyone agreed that the spirit in the girl was evil, and in any case several people in the crowd where Paul was a visitor thought he had no right to do what he did. Most upset were her owners who saw their easy cash going up in smoke. Her owners brought official charges against Paul and Silas in particular, and the magistrates found in favor of the hometown plaintiffs. The punishment far exceeded the crime. The magistrates ordered Paul and Silas stripped in public and beaten with rods until they could barely stand. Then they were put in the city’s maximum security prison with their feet in stocks. Moral of the story: never harm a harmless psychic, even if you don’t agree with Dionne Warwick that they actually exist and deserve a daily phone call from you. After Jesus’ execution, his followers were left in a pretty pathetic situation, and as they took stock of what they had to work with regarding the continuing of his ministry, they didn’t have much. This is why many critics through the years say that they had to recreate Jesus completely to make him and his mission palatable to a next generation. The last two memories they had of him, working backwards, were his execution and all that was involved in how Rome got him to a cross and just ahead of that they had the memory of how he, at the end of a Passover meal, he had asked them to remember him when they gathered in community and nibbled a piece of bread and sipped some wine. My work isn’t done, but the Romans are going to kill me. Remember me and what I’ve tried to teach. Let the bread you eat always be a symbol for my body, which will be broken; and let the wine you sip from a common cup always be a symbol for my blood that will be unjustly shed by a godless government who believes its capacity for brutality and terrorism are greater than God’s love. They are wrong, and if I have to die because I won’t play along with these paranoid Romans, then I shall. That sounded rather dramatic and moving the first few times they remembered him that way, but it lost its appeal and inspiration. Some of the early theologians said, “Geez, you wouldn’t think the Lord’s Supper boring or irrelevant at all if you understood the real magic that’s involved in it. The bread literally becomes Jesus’ physical body, and the wine becomes his blood–even though they still look like unleavened and a little fruit of the vine. When you come to the table, you are ingesting the body and blood of the Unique Child of God. Wow! What true follower of Jesus or wanna be follower of Jesus could turn down an offer like that. “Transubstantiation” they called it, and some groups within Christendom still believe in such magic; it’s magic or a miracle that happens when the properly appointed priest prays the proper prayer over the elements. The last thing Jesus wanted was that kind of veneration of anything physical, especially a set of claims that would have the earliest followers after his death accused of cannibalism as a result of this very belief. There are still plenty of those who consider themselves Christian who just aren’t satisfied with the plain ole every day Jesus who died in agony and defeat and who eschewed religious pomp and circumstance. What he envisioned as a piece of bread was just that, a piece of bread. What he envisioned as a sip of wine was just that, a sip of wine, very plain everyday foods. There were foods on the able around which this first “Last Supper” too place, but Jesus ignored those. There was a reason for that. You see, if Jesus’ concerns aren’t a part of the everydayness of our lives–the routines, the less than interesting repetitious acts required of all of us–the chances that Jesus’ concerns will be a part of the momentous aspects of our lives are practically zilch. If all we want from him are miracles and magic, he knew there would be no loyalty to his teachings when the going got tough; and for all who attempt to live by the teachings of Jesus in a world that loves hatred and hates love, there will be tough times and no magic to either rescue us or entertain us. Amen.